Alberto Martini received instruction in art from his father, Giorgio, who was portrait painter and a professor of drawing at the Istituto Tecnico in Treviso. Alberto's abilities as an illustrator were quickly recognized, and his work was included in the 1897 Venice Biennale. Martini's visit to Munich the following year proved crucial to his development. There he worked as an illustrator for the magazines Dekorative Kunst and Jugend. Martini's illustrations were strongly influenced by Northern Renaissance printmaking and draughtsmanship, in particular by Hans Baldung Grien. In 1901 he illustrated an edition of La Divina Commedia, and as from July 1905, produced 132 ink illustrations, described as macabre, for the stories of Edgar Allan Poe. His illustrations achieved an international reputation. Martini visited London in 1907, when he held a one-man show at the Leicester Gallery. The English publisher, William Heinemann, an admirer of Martini, organized a major exhibition of his work at the Goupil Gallery in 1914. Two further one-man shows were held at the Leicester Gallery in 1916 and 1918. Encouraged by the critic Vittorio Pica, who championed Martini's work enthusiastically for over 30 years, the artist took up pastels, executing numerous works interpreting the theme of woman as a butterfly, which he also explored in lithography. Martini's first involvement with the theatre came in 1919-20, He introduced innovations to theatre and set design which he illustrated and published in the book Il Tetiteatro in 1923. He became disappointed and resentful towards Italian critics who, in the late twenties, demonstrated apparent indifference to his work so in 1928 he moved to Paris. From 1929 to 1934 he produced a large number of paintings. He returned to Italy in 1934. 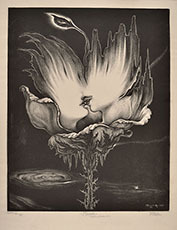 Martini made his first etchings in 1898, but it was in the field of lithography that he made his most important prints. Between 1899 and 1900 he produced a set of 19 chromolithographic postcards and posters which reflected his knowledge of the Vienna Secession and of late Pre-Raphaelite art. Martini's earliest drypoints were made in 1910 -1911. The peak of his printmaking came in the period 1914 - 1916, when he worked closely with the Domenico Longo lithographic workshop in Treviso.